The opening scene in the 1950 film Sunset Boulevard shows William Holden’s body floating face-down in a pool of water. Gently floating, he looked more serene than he did dead. But the black and white film took away any life that was left behind in the beauty of the water. One of Karine Laval’s photographs in her book Poolscapes draws a parallel, but her photograph is alive with colors and a vibrance that’s almost too real. Laval’s depiction of pools in the book Poolscapes begins with explicit images of those same pools albeit overexposed with green and blue overtones. The images look surreal, which develops as the book progresses, ending with abstract photographs of pools and water that blur the lines between photography and paintings. The greenish hue of the images gently transition into blues and slowly introduce splashes of yellows and reds, like a Rothko painting. What adds to the intrigue of the images is the way that none of the subjects look directly into the camera. In fact, you’re unsure wherein the focus lies, in the people or the water. The spread where two women are stepping out of what looks like a public pool is particularly striking. Laval frames the photo such that either their heads are cut off, or you can’t really see their faces. And while there is no water in the image, the color of the sky and the blues of the bathing suits make it look as though the entire image could have been taken through a polarizing filter. The two images, side-by-side, are imperfect reflections of each other. Laval romanticizes water in a way that is reminiscent of a lover capturing their muse. In some of the photos the foreground and background is either silhouetted or overexposed, leaving water as the only visible part of the image. Laval’s choice of angles adds depth to them, a quality like looking at a stage from the back of a proscenium theatre. The infrastructure and people that do exist in some of the photographs look distorted or exist in silhouettes and even when Laval doesn’t really show the water, the essence of it comes through. 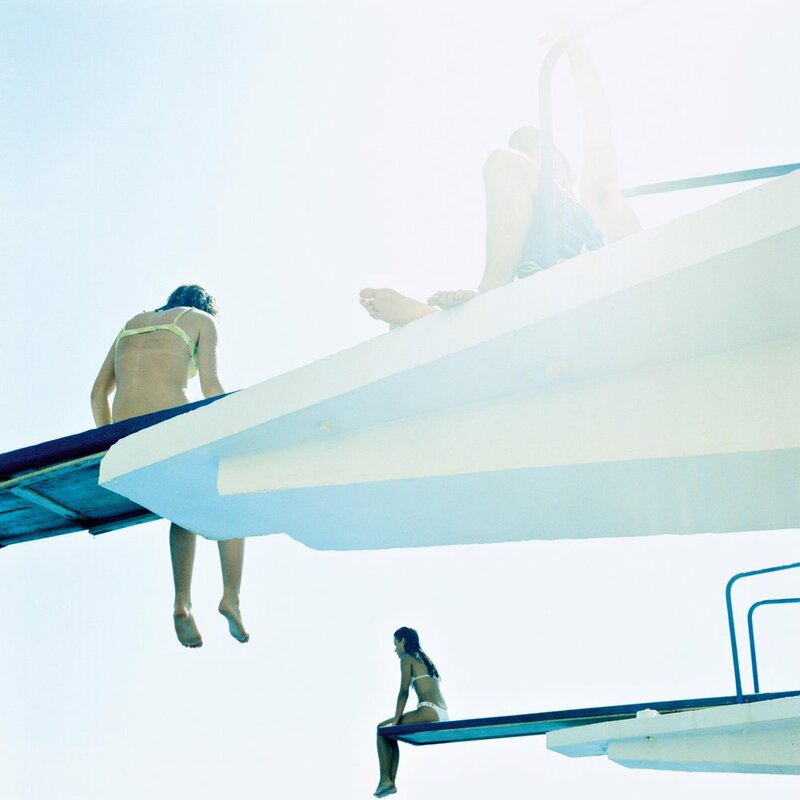 She transforms documentary photography into art by her use of angles, colors and composition. The lay out of the book uses great juxtapositions and maintains a visually harmonious rhythm throughout. Many of the photographs are reflections in the pool, which at first makes you question what you’re looking at. The reflections show different shades blending together like watercolors, creating a rainbow in a single photograph. It brings to mind a modern interpretation of Bert Haanstra’s 1950 film Spiegel Van Holland (Mirror of Holland). The book traverses from poolscapes to reflections to underwater images and ends the way Sunset Boulevard begins – with human forms floating in vibrant ripples of purples and blues. Laval’s photographs can bring a variety of emotions to the fore, but the one that stands out the most is the way it entices the reader to jump into the closest body of water. And stay there.